Keeping dogs from being surrendered to shelters to start with is one way to keep numbers down. Not only is training important but one that's not talked about as much is socialization. Training (meaning a sit, down, stay type or operant conditioning) is great. 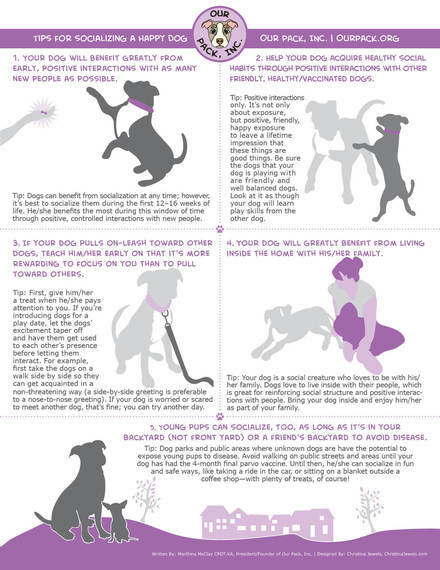 But, what if you your dog has a hard time being around people, other dogs or strange places? Then operant conditioning will only go so far. Socialization works best when it's used as a preventative rather than a cure. Not that socialization doesn't help older dogs, it does. But, it's best when behaviors are prevented, then less dogs are surrendered to shelters due to behavior issues. Note that all dogs are individuals in how they respond to the environment, training, socialization and management. Here's a pdf link to this handout seen here. Great for young pups. Marthina McClay is a professional dog trainer, behavior specialist for all breeds of dogs and the director of Our Pack, Inc. a non-profit education, training and rescue organization for pit bulls and Chihuahuas. Some of their work includes the Michael Vick case and other high profile dog fighting cases.